Kami hadir di Kota Solo untuk menyewakan mainan berkualitas dan edukatif untuk buah hati anda serta perlengkapan bayi dengan biaya sewa terjangkau. Dengan bermain, anak-anak dapat belajar banyak hal, berlatih keterampilan, mengembangkan imajinasi dan kecerdasan. Mainan yang kami sewakan dapat memberikan stimulasi yang tepat dalam setiap tahap perkembangan buah hati anda. Kami akan selalu menambah koleksi mainan terbaik untuk buah hati anda. All aboard! This versatile train is also a teaching tool. Introduce baby to numbers, letters, colors, songs, stories, and more through two learning modes-walker mode and discovery mode. A place full of wonderful sights and sounds the Rainforest Jumperoo brings it all down to size for little explorers. Still tons of safe jumping fun (which will activate rainforest music and lights), but now there are toys all around the rainforest-and overhead-with a spinning seat that helps baby explore them all. A kids truck with the durability of Little Tikes and the fun of our Cozy Coupe. This truck-styled riding toy is ideal for toddlers and preschoolers. The foot-to-floor format is easy to start, stop and steer. Use it indoors or out. Open Thomas' wagon to reveal colorful blocks that you can decorate with numbers and pictures of some of the Island's friendliest engines. A cute and lovely spacious double home for your children whereby they can play, learn & enjoy to the fullest. Musical mat play grows with baby! 3. Sit & Jam! Remove the arches so that baby can sit up and put on a musical show. When baby hits the same instrument twice in a row, the song will grow! The Micro Trike Deluxe is the ultimate shopping companion. Lightweight and foldable, it is extremely compact, perfect for parents on the go. Micro Trike is adaptable and can be simply hung on the shopping trolley or packed away in a rucksack. Not to mention the kids will also enjoy the fun of a ride through the shops of the city, it's a win win. Compact and Self standing when folded, convenient for storage. 3-position adjustable and removable front tray. A detachable plastic serving tray convenient for baby’s snack time. With ultra wide footrest for baby’s super comfort. The Joie Pact Flex is suitable from birth thanks to the flat recline it includes an adjustable leg rest for comfort and UPF 50+ sun canopy that protects your little one. Specialised flex comfort ride cushions baby’s body with a spring suspension system offering a 30% smoother glide than other strolling rides. Includes features aplenty including fast one-hand fold experience. Packed with a flip up or down leg rest and handy extras for parents too. Dimensions: Open Size: l 88cm x w 47.8cm x h 100.1cm. Folded Size: l 52.5 cm x w 26.5 cm x h 56.5cm. Pagar Parklon memberikan ketenangan pikiran pada orang tua saat melakukan pekerjaan rumah, karena Parklon menyediakan area bermain yang menyenangkan dan aman untuk bayi tanpa harus mengawasi setiap saat. London Taxi kick bike, sepeda untuk anak umur 2 - 5 tahun. Balancing bike berguna untuk melatih keseimbangan anak dalam belajar bersepeda, melatih motorik kasar serta melatih kepercayaan diri si kecil. Light the way to active play with the Light ‘n Go series of toys, designed to use light to inspire your baby to get moving. The 3-in-1 Activity Walker is a walker, standing activity table, and sit & play activity center all in one. The walker's projected lights encourage your baby to take their first steps as they grow with this interactive toy. Featuring 70+ activities, songs, and sounds, the 3-in-1 Walker and Activity Table provides hours of fun for years to come. The Disney Baby Winnie the Pooh Happy As Can Bee Walker from Bright Starts will surround your baby with the most beloved friends from the Hundred Acre Wood. This sturdy platform with added safety features entertains babies on the move with a removable toy station that's great for on-the-go, a spinning roller ball with beads, fun Winnie the Pooh squeaker, and Tigger toy. Music, sounds and lights along with volume control keep baby entertained. The seat pad adjusts to three height positions to give baby some room to grow. 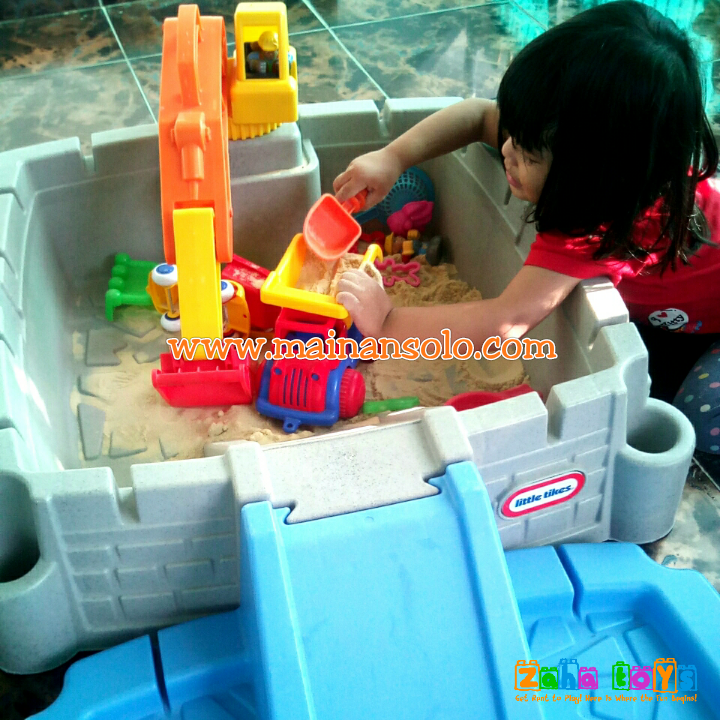 Parklon PE Roll Playmat adalah karpet mainan anak yang mempunyai 4 ujung sisi yang tidak tajam. Table & fun slide with basketball ring to promote active play. Picnic table is perfect for snack time & play house for imaginative play.